Occasionally we receive requests from various kinds of organizations asking us to disseminate information about them to our members. In the past, we have generally published such information only when a FLAME member has made a recommendation. At the FLAME Board meeting that took place on Jan. 17, 2007, it was decided to create a special page devoted to information that is potentially of interest to our members--with the understanding that this does not constitute an endorsement by the FLAME Advisory Board. Have you checked out the FLAME Facebook page? 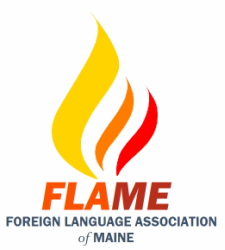 Fred Ravan keeps the FLAME Facebook site updated as Foreign Language Association of Maine. He posts something every day and tries to put something about each language. ACTFL is spearheading an initiative aimed at addressing the coming foreign language teacher shortage, as detailed in the 2016 Department of Education study released Fall 2016. In partnership with Educators Rising, ACTFL is piloting student-to-teacher extracurricular programs in high schools across the country to empower current 10-12th grade students to be the 21st century language teachers that we need. We are seeking teachers ready for this challenge, willing to test-pilot the 6-10-week curriculum and provide ACTFL with feedback. If you would like to participate or know someone who would be interested, please fill out this interest form (more info in link), respond to this email, or forward this email! Thank you for your help! ACTFL constantly grows from the contact and collaboration with its members!